This is the story of a gutsy journalist who challenged power-and succeeded. 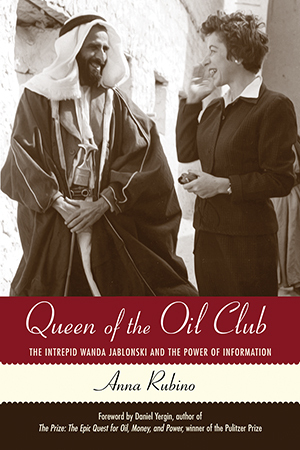 Wanda Jablonski was an investigative reporter, publisher, and power broker who came to wield exceptional influence on twentieth-century geopolitics by shedding light on the secretive world of oil from the 1950s through the 1980s. Jablonski unveiled many mysteries of the oil club, an elite group of Western executives who once controlled the international petroleum business. Nicknamed the midwife of OPEC, Jablonski undermined Big Oil’s dominance by exposing the vulnerabilities of the major oil companies and encouraging the rise of oil nationalism. Her scoops, commentaries, and private networking helped shape the debate that led to the creation of OPEC, the oil shocks of the 1970s, and the largest transfer of wealth in history. Tenacious and glamorous, Wanda-as she was known in the oil world-coaxed her way into exploration sites in Middle Eastern deserts, drilling camps in the Venezuelan jungle, male-only boardrooms in New York and London, and the king’s harem in Saudi Arabia. She survived threats, boycotts, and suspicions of espionage as she elicited information and insight from CEOs of the oil giants and political leaders, including the shah of Iran. Working for the Journal of Commerce and other New York publications, Jablonski defied the prevailing view that a woman reporting on business had no credibility. In 1961, divorced and suddenly jobless, she took a big gamble by starting her own newsletter, Petroleum Intelligence Weekly, which was soon dubbed the “bible” of the oil world. Today, when conflict in the Middle East and climate change cause us to reexamine our reliance on oil, Jablonski’s prescience-whether about oil dependency, cultural insensitivity, or market manipulation-proves remarkable. Anna Rubino, who reported for Jablonski in the 1980s, uses scores of interviews, exclusive access to her private papers, and newly declassified information to tell the dramatic story of this journalistic pioneer and the power of information. "How one woman hurdled journalism’s gender barrier to help shape the future of Big Oil...Intimate but also sweeping, capturing the myopia of both business and government as America’s addiction to foreign oil set in over four decades." For more information, visit www.queenoftheoilclub.com.